The Fitness Connection - Why a Trainer? "I can't seem to stick with an exercise program." "I don't have the time or motivation to go to the gym." "I am uncomfortable in a traditional gym setting"
"I've been working out on my own but I cannot seem to reach my goals"
If you can identify with any of the above statements, a fitness trainer may be exactly what you need. A fitness trainer makes sure you are doing the right exercises based on your fitness and/or health goals. Hiring a trainer will ensure that you are exercising correctly to minimize injury and efficiently maximizing your time. 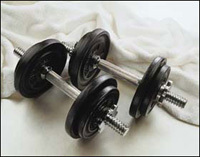 Most importantly, a trainer will make sure that you are working out regularly - whether you feel like it or not! As your trainer, I offer you all of the above and more. As women grow older, our body chemistry changes. We wake up one morning and our jeans no longer fit. We feel terrible about ourselves. Our esteem takes a hit. So we go on a diet. We lose 5 pounds or 10 pounds or 50 pounds, and we fit into our jeans again. We feel great about ourselves! So we stop the diet because now we've lost the weight. After all, diets aren't forever. A few weeks, perhaps months later, again, those darn jeans are tight. Feeling miserable again? Time to start up that diet. The weight comes off, and you feel great about yourself again. You reach for the infamous jeans, and they don't fit! But you"ve reached your goal weight! Did the dryer shrink them? What is going on? I can tell you exactly what is going on. It's called the yo-yo effect. When you continuously lose and gain weight, you actually end up in a bigger size! By losing and repeatedly gaining weight, you have actually lost muscle and gained more fat on your body. That's why simply cutting calories backfires. The more calories you cut, the more your body holds onto its fat stores. Your body goes into "starvation response" mode. In fact, it hangs onto those fat stores for dear life. Your body metabolism slows down, and your body "feeds" off your muscle. And since pound for pound, fat takes up more space than muscle, you now need bigger jeans, and you do not feel good about yourself ... again. That's why it's so important to work with a trainer who understands how the female body responds to fitness and nutrition. The routine your best friend is doing may not work for you - that's because we all respond differently to different workouts. Some women need to focus on more cardiovascular training (often referred to as cardio), others on more weight training; some woman may need to eat less, some may need to eat more, and others may need to simply change the types of food they consume. Your individual body type and metabolism all play a role in the type of fitness routine your body will respond to best. The Fitness Connection can help you determine the right routine for you! Start feeling great about yourself today and call or e-mail me about a free consultation! © 2005- The Fitness Connection Killingworth, L.L.C.